But SERIOUSLY, I can’t tell you all how many times I have done this and the next morning after pushing my snooze button 67 times and rushing to get ready, it comes ALL undone. Make-up brushes are falling in the sink, hair products have lost their caps on the floor, the curling iron and blowdryer are sprawled all over the counter, and before I know it…all of my “feel good” bathroom/vanity organization has gone down the drain. 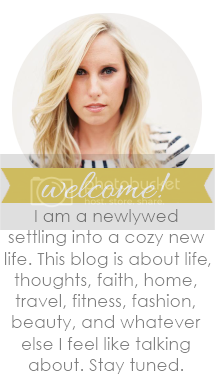 This is where the DELUSIONAL part of this blog title comes in to play. Can I really keep my belongings this organized day in and day out? (This time, I promise….it is going to stay like this.) 2 hours of organizing later…Here are the results. Part 1: Instead of digging through a makeup bag to look for what I need in the morning, I felt it best to save some time, put it all on display, and make my mornings easier. 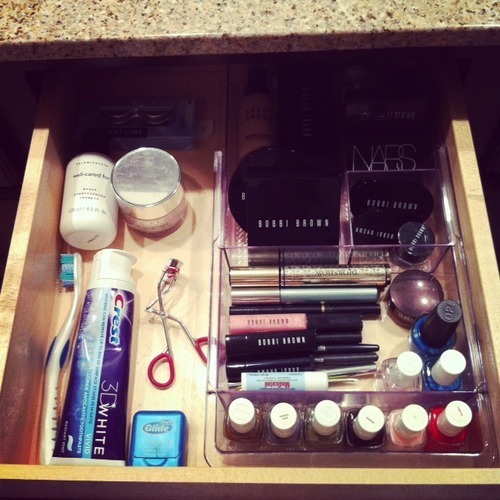 I decided to get a drawer organizer strictly for make-up. Everything is so easy to access. Part 2: Brushes…Lets be honest, they are annoying….especially when you are digging through the bag trying to decipher between the eye-liner brush and the lip-gloss brush. I decided to grab an old glass vase and pick up some of those flower vase beads at Hobby Lobby to prop them up. Now I can actually see what I am going to use and they always stay upright keeping the bristles safe! 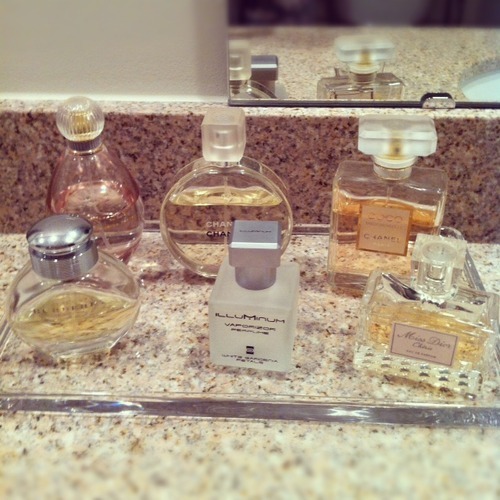 Part 3: I am a big perfume lover so I like them on display. Some days I am in the mood for musky, somedays floral, somedays fresh, & somedays straight up classic Chanel or Dior. I found this really cool glass vanity tray at Crate and Barrell (http://www.crateandbarrel.com/glass-vanity-tray/s219269) for $16.95 and I love it. 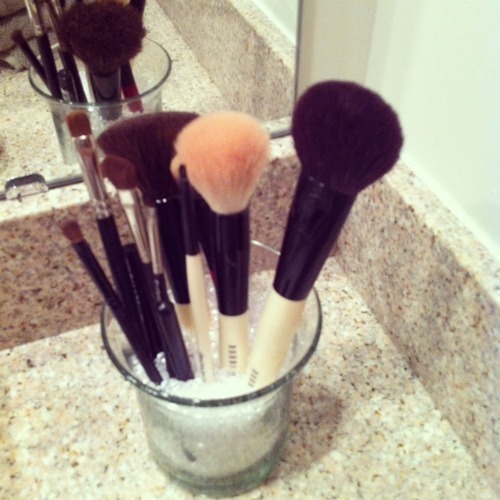 It is so classy and makes the bathroom vanity look polished. I bought my husband one too for his cologne. Part 4: Who would have thought a spice rack would come in handy this much?!?! 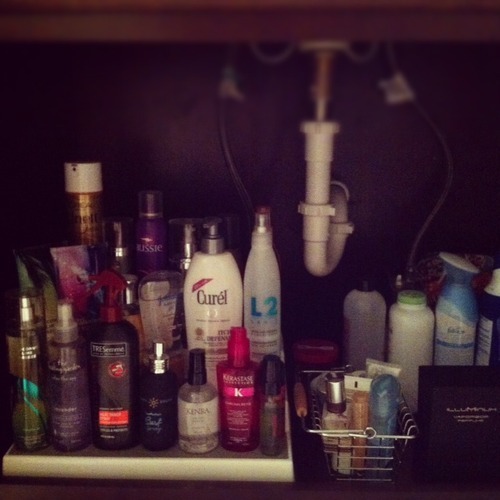 Seriously, I picked this up at Target for like 4 bucks and I can see every one of my hair styling products, lotions, and body sprays under the cabinet. They are “under the cabinet shelves.” LOVE. Anyway, now that I am organized…crazy for spending 2 hours on this…and possibly delusional that it could actually stay like this, I hope I have inspired you all to get creative when it comes to organizing and making life more simple and COZY. Living an Abundant Life....Beyond "me"
The Adventures of an Art Auction and a Pot Roast.